Ah focus. Some people have it, I don’t. I’m easily distracted by possibilities, by day dreaming and by imagining the worst of the worst case scenarios. Yet, once in a while, I will spring into action at a moment’s notice, after realizing that life cannot continue on in this manner. After having one of those “I cannot stand this room one more minute” moments, I decided to get serious about our dining room. I had already attempted a Style Cure (HA. HA HA HA HA!) that was interrupted by 6 weeks of 14-hour work days, followed by binge holiday cooking baking (not having an oven for 3 years will do that to you), followed by a very sick kitten (who has since recovered, but not before consuming a healthy amount of our home restoration savings). Anyway, time to get this room done! With newfound enthusiasm, work resumed. 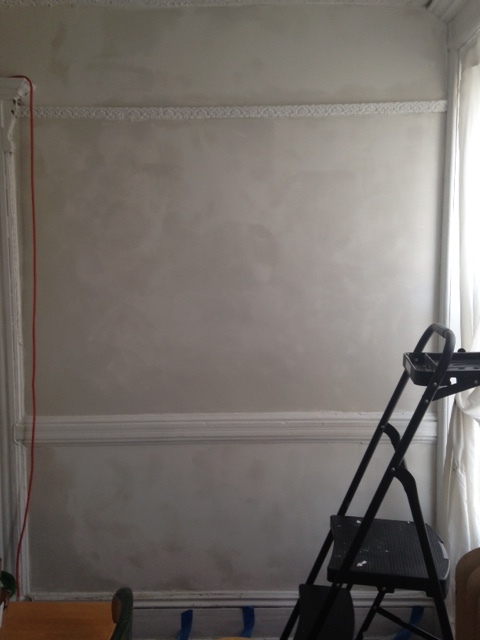 I begun skim coating the walls – after a steep learning curve, I’m getting quite good at it. It’s t time-consuming (what else is new?) because I discovered that many thin coats are much better than one or two thicker ones. please excuse crappy cell phone photo, which makes the moldings appear bowed. They are not. So slow we go, that is, until I notice that one of the houses in the back is being renovated. This precipitated a trip around the block and the discovery of a ton of Victorian trim, just tossed in the front yard. What started as a quick peek, stretched over a couple of hours of treasure hunting in sub-zero temperatures. The guys showed me inside and to another pile of “garbage,” far more than what I could take in one day. With a gargantuan dumpster looming over me (and my soon to be) salvage, the nice people said I could come back Saturday morning at 8 am and take anything they didn’t want to keep. Long story short, the car was filled 3 4 times (and counting). 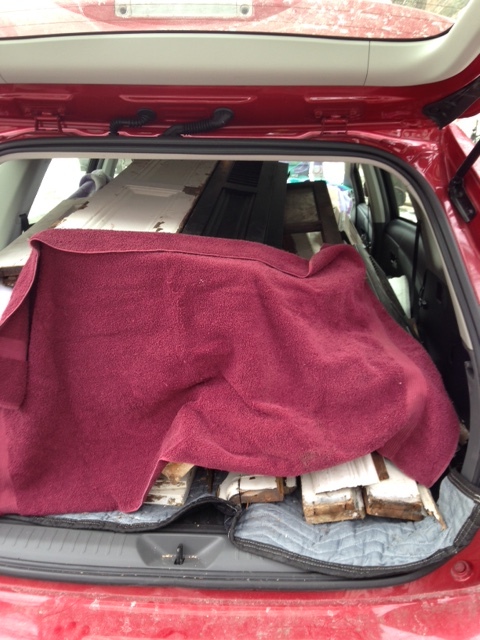 The overflow (which included two carved fireplace mantels) was walked around the corner. I’m happy I was able to save so much mill work, yet I’m sad for all the other wonderful things I wasn’t able to save. The house was nearly intact before the gut renovation started. I wish I had stopped by earlier. It’s heartbreaking (to me) when people rip out details from old houses. A Brooklyn brownstone is not meant to look like a loft; I have very strong feelings about plaster and the role of bricks in a brownstone (to be hidden by plaster and never seen). I also realize I’m not Queen of the Universe and these are just my opinions (surely this is an oversight due to be corrected any day now). Until then, if detail must be ripped out, then at least it should not go to the dumpster. It should be saved and re-used by those of us who appreciate it.